Despite months of railing against the Affordable Care Act, or "Obamacare," presidential hopeful Mitt Romney says he does like a few parts of it. The Republican, who sat down on Meet the Press on Sunday morning, admitted that he'd keep some of the Affordable Care Act, like coverage for patients with pre-existing conditions and allowing young adults to remain on their parent's insurance, reports CBS News. "I say we're going to replace Obamacare. 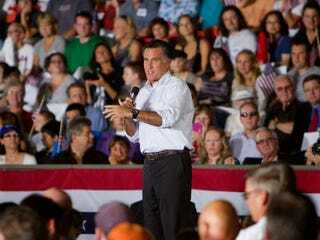 And I'm replacing it with my own plan," Romney said. "And even in Massachusetts when I was governor, our plan there deals with pre-existing conditions and with young people." In the interview, Romney, a former Massachusetts governor, also said he would offset his proposed tax cuts by closing loopholes for high income taxpayers. "We're not going to have high-income people pay less of the tax burden than they pay today. That's not what's going to happen," he said. When pressed, however, Romney declined to provide an example of a loophole he would close.